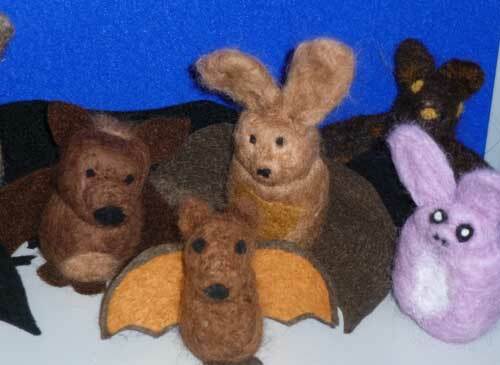 Yesterday some of us went along to the SE Bat Conference, even thou we are not i the SE groupig of bat groups. However, we do work with both Hets and Middlesec and North BUcks and we promised to behave ourselves. Had a great day networking ( that’s gossiping to you) and heard some very good talks. In the afternoon there were a series of workshops, and Viv and I bunked off the more technical workshops and headed to a session on bat crafts and found ourselves having a go at needle felting a bat. What emerged was not necessarily very bat like but we had a good laugh – as doubtless did some people who saw our efforts! 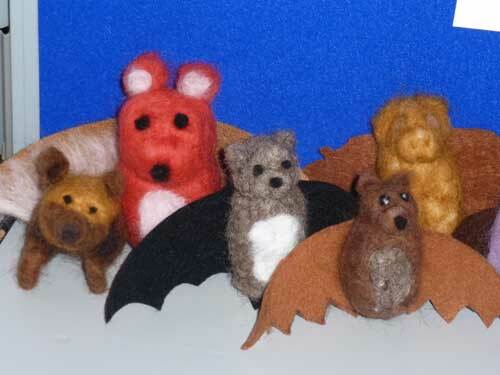 This entry was posted in Uncategorized and tagged Bat Conservation Trust, needle felt bats, SE Regional Bat Conference. Bookmark the permalink.